It's a pretty standard Wetherspoons, with a low ceiling, patterned carpet, and a mixture of booth seating and freestanding tables. 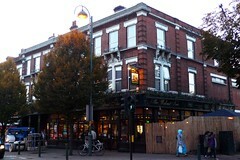 The pub sits on a corner, and along one side is a relatively large area of outside seating, with parasols above and separated from the pavement by a tall fence. Kake and several friends visited on a Wednesday evening in September 2012. Eight real ales were available: Hook Norton Double Stout (£2.30/pint), Jennings Crag Rat (£1.99/pint), RCH PG Steam, Adnams Broadside, London Pride, Abbot Ale, Ruddles Best, and Courage Directors. There were quite a lot of people in at 6:30pm, though several tables were still free; the place remained busy throughout our visit. Service was friendly. Like all Wetherspoons, food is served all day from a standard menu. Accessibility: No step to get in, and it's step-free through to the bar, the ladies', and much of the seating. Some of the seating is on a dais. Last visited by Kake et al., September 2012. Opening hours taken from the 2013 Good Beer Guide. Last edited 2013-09-12 23:55:58 (version 3; diff). List all versions. Page last edited 2013-09-12 23:55:58 (version 3).